Click here for "Composer's Notebook", an essay by the composer. Click here for "Boulez vs. Stockhausen", an essay by the composer. Click here for "Is Rock Dead? ", an essay by the composer and public exchange. Click here for RealAudio version of excerpt from Guitar Trio, 2:37/151K. Click here for RealAudio version of Hornithology, 4:27/261K. Click here for RealAudio version of excerpt from Charm, 2:20/136K. Click here for TrueSpeech version of excerpt from Guitar Trio, 161K. Click here for MPEG-2 version of excerpt from Guitar Trio, 605K. New! 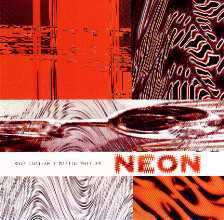 Rhys Chatham & Martin Wheeler's NEON, on the NTone Label. 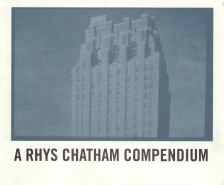 Rhys Chatham was born in Manhattan in 1952. He came under the musical influence of his father, Price, a harpsichordist, and became a devotee of the work of early music composers such as Giles Farnaby and John Bull, playing their music on a virginal. Switching to baroque and Boehm flute, he soon became interested in contemporary music and began playing the work of Edgard Varèse, Luciano Berio, Stefan Wolpe, Mario Davidovsky, and Pierre Boulez. His immersion in the contemporary literature for flute led to his desire to compose. He began studying counterpoint and harmony at the age of 13 with Donald Stratton and Tom Manoff, who sparked his interest in serialism. While at NYU, Chatham met Morton Subotnick, who encouraged him to compose electronic music. Working under Subotnick's guidance at the NYU Studio for Electronic Music, he met Maryanne Amacher, Charlemagne Palestine, Serge Tcherepnin, Ingram Marshall, and Eliane Radigue. These composers, more than anyone else, kindled Chatham's interest in music of long duration, which ultimately led him to study and work with La Monte Young, tuning his piano in just intonation in exchange for lessons. Rhys Chatham studied tuning under Hugh Gough in New York and William Dowd in Cambridge and supported himself during the early seventies by tuning the instruments of such artists as Gustav Leonhardt, Albert Fuller, Paul Jacobs, and Glenn Gould, to name only a few. His ability to tune and hear harmonics lead to his interest in making compositions incorporating the overtone series. This interest stayed with him long after the digital tuner rendered his harpsichord tuning skill useless. Chatham wrote his first composition in just intonation in 1971. Following the lead of musicians such as Young, Terry Riley, Cornelius Cardew, and Frederic Rzewski, he then began working as a composer-performer with non-notated music of various sorts, which culminated in 1976 when he first started working with hard rock. Rather than simply appropriating rock music, he worked as a kind of "secret agent" in the field, becoming an active figure on the late-night rock scene in New York City. With his composition, Guitar Trio (1977), Rhys Chatham became the first composer to make use of multiple electric guitars in just intonation to merge the extended-time music of the sixties and seventies with serious hard rock. By 1982, Chatham was going deaf from playing too much loud music. He decided to make a series of fully notated pieces for the slightly quieter brass family of instruments. After awhile, this renewed interest in notation (and an improvement in his hearing) led him to return to writing for electric guitar ensemble; Die Dönnergötter (1984-86) was his first effort in this direction. After a series of interim pieces he concluded this period with an ultimate work, An Angel Moves Too Fast to See (1989) for a symphony of 100 electric guitars, electric bass, and drums. Rhys Chatham's compositional concern has been to bring together seemingly incompatible elements and put them through a personal filter so as to vertically align them. During the seventies and much of the eighties, he devoted himself to combining the pounding, throbbing rhythms of rock with the aesthetic concerns of post-minimalism. At the end of the eighties, his compositional interest turned to making full use of the enormous freedom composers now have available to them by launching an investigation into the nature of this freedom itself. Grand Théâtre du Genève: Symphony No. 4 (1994) for full orchestra. Orbe Théâtre: TAUROMAQUIA (1993) for 100 electric guitars, bs, and drms. Evening length theater piece by Jean-Philippe Guerlais. Lyon Opéra Ballet: Les Vespres de la Vierge (1992) for 8 singers, 2 trpts, 2 sax, trombone, tuba, and percussion. For a dance by Ralph Lemon. Musica Festival à Strasbourg: Warehouse of Saints: Songs for Spies, (1991) for 100 el guitars, bs, drms. Brooklyn Academy of Music: The Heart Cries with Many Voices (1990) for 9 early music singers, 6 el.gtrs, el. bs. & drums. Serious Fun! at Lincoln Center: Minerva (1988) for 2 trumpets, battery, and el. gtr. ensemble. Massachusetts State Council on the Arts: Die Dönnergötter (1984-86) for 6 el. guitars, el. bass, and drums. S.E.M. Ensemble: Waterloo, No.2 (1986) brass and battery. Groupe de Recherche Chorégraphique de l'Opéra de Paris: For Brass (1982) for brass octet and drums. For a dance by Karole Armitage. Karole Armitage Dance Co: Drastic Classicism (1981) for 4 el. gtrs., el. bs, drums. 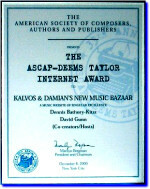 He has been a recipient of CAPS, National Endowment on the Arts, New York State Council on the Arts, Massachusetts Council on the Arts, Meet the Composer, and Foundation for Contemporary Performance Arts Fellowships. Die Dönnergötter (Dossier, re-release in America on Homestead). Altesse dub version (Virgin Records), compilation entitled Macro Dub Infection 2, composed in collaboration with Martin Wheeler.